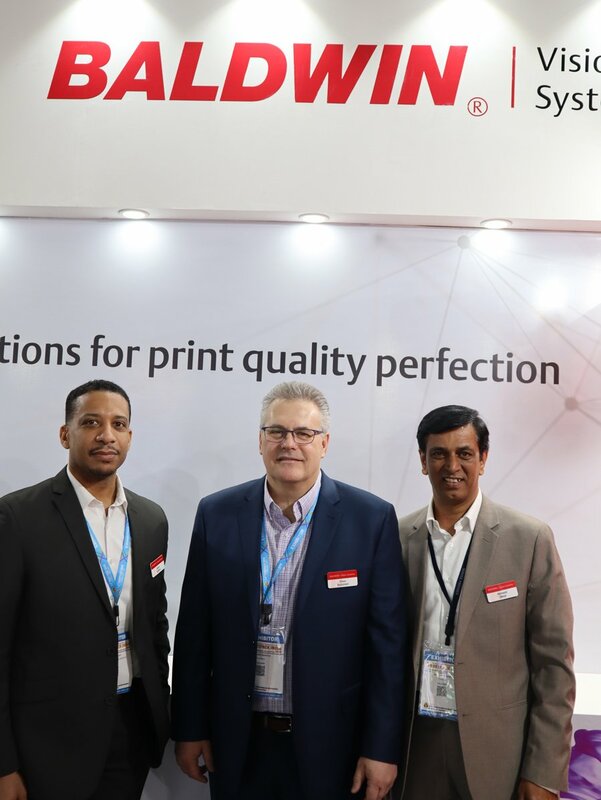 Baldwin Vision Systems’ commitment to the Indian market and to India is quite clear at Printpack 2019. Its participation at the show, including its security printing business manager Erwin Wagner’s talk at the Print Business Outlook Conference, is beginning to reveal the nature of the new, bigger and more diverse Baldwin Vision Systems to the Indian market. The company, which was known only for its chilling and recirculation systems and its 100% inspection systems on newspaper and gravure presses, is now talking more coherently about its products for security print, UV curing and inspections systems for label presses and of course its increased level of manufacturing and product development in India. At the Baldwin Vision Systems stand in Hall 14, we met with Vince Balistrieri, president of Baldwin Vision Systems, Isaam Lutfiyya, director ‒ global sales and marketing and Saas business unit leader, Baldwin Vision Systems and Hemant Desai, director of Baldwin Vision Systems India. Balistrieri explained that BVS has a long history of partnering the key Indian manufacturers of presses such as Manugraph, Expert, Pelican and Uflex. “Our registration and inspection system are as essential to printers as a good set of tires on a Ferrari,” he said while also reiterating the company’s tagline “Unlocking your potential,” as the key enabling company for world-class quality and error-free print production with efficiency. Desai explained that apart from the innumerable registration installed by the company in India, all the BVS inspection systems are 100% inspection systems. While the level of complexity and automation and other features may vary as per application and speed, the systems are all capable of meeting the increasingly higher requirements of brand owners looking for 100% inspection reliability. The BVS strategy is clearly to help its customers unlock their potential by providing not only ‘India First’ products but also to partner local companies such as Bodhi Systems in helping clients optimize the potential of their automation and quality checking and color control systems. Lutfiyya enunciated the India First policy by describing three products that have been either developed and first launched here or which are receiving the newest versions prior to other global markets. These are the new generation Autotron 3600, which has already received a considerable number of orders that are being implemented and installed in Q1 of 2019. This is a system that was co-developed by the BVS India team. Second are the new modules of the ColorTrack software. And the third India First product is InkWeigh ‒ a presetting and on-press software based system for control and standardization of print color quality. Additionally, Lutfiyya spoke of how the company’s new plant in Ahmedabad has focussed the recently enlarged BVS group – giving it more energy to build products and consultant partnerships while more intensely engaging with OEMs in the country. Lutfiyya sees enormous potential in the BVS investment.“India is a good investment destination for BVS because it’s the world’s largest democracy, a high level of GDP growth, a stable economy and it is friendly to foreign direct investment,” he said.